Persimmon trees bear fruit that is eaten for enjoyment and used for medicinal purposes. 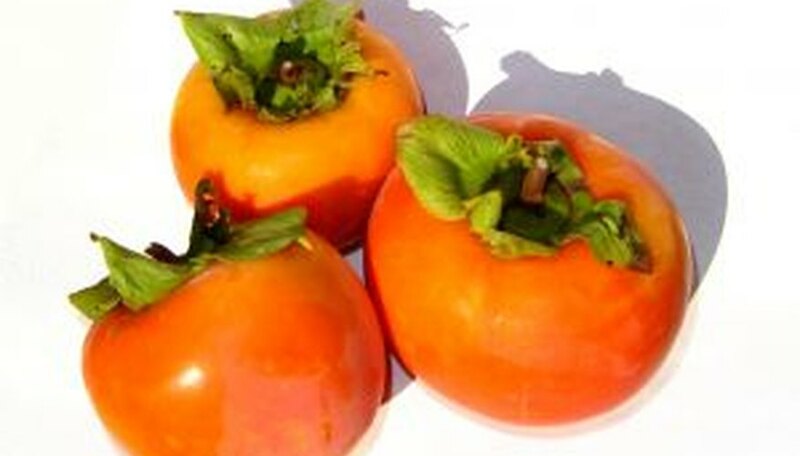 There are two types of persimmon trees: Asian or North America. All persimmon trees grow well in USDA Hardiness Zones 7 to 10. They go dormant in the winter months and can tolerate temperatures to zero degrees F when they are in their fully dormant stages. They do not do well in extremely hot, desert-like conditions. Generally, persimmon trees bear fruit only after 10 years. Select a persimmon tree. Asian persimmons produce larger and sweeter fruits, and can produce fruit from a single tree. American persimmons need at least two trees, one with male flowers and one with female flowers. Together, they will pollinate and produce fruit, which are smaller and not as sweet. Choose a site with well draining soil in full sunlight. Areas that have plenty of air flow are preferable. Stay away for any low areas in your yard that may be susceptible to standing water. If you are planting multiple trees, plant them 15 to 20 feet apart. Dig your hole deep, about twice the size of the root ball and four times as wide. Set the soil aside to prepare it for planting. If your soil is heavy, add some sand or compost to make it loose for better drainage. At the same time, check the pH level with a testing strip available at most garden centers. Persimmon trees like slightly acid soil, around 6.5 to 7.5. Add sulfur to lower the pH or add limestone to increase it, depending on your results. Follow the manufacturer's directions since each brand has different strengths and dosing instructions. Unbundle the root ball and shake off any clumping dirt. Fill the hole about 6 inches with the new soil. Place the root ball in the hole and fill in the rest of the soil. Tamp it down to remove any air pockets. Cut the tree back to about three feet after planting. Prune the tree the first few years thereafter to keep the tree from becoming too heavy. Cut new growths and headings each year to maintain a vase shape. Fertilize it, if desired. Some persimmon growers fertilize each year, while others fertilize only when the mature leaves are not a deep green or if the new shoots grow less than a foot a year. Use a balanced fertilizer such as 10-10-10 or 16-16-16. Fertilize in February or March before the growing season. Follow the manufacturer's directions since each brand has different strengths and release rates. Keep your persimmon tree well watered. A persimmon tree needs between 36 to 48 inches of water each year, most of is needed from spring until fall. Watering a couple inches once a week during that time is usually sufficient since the tree has deep roots. However, if you live in a very hot climate, you will need to water two or three times a week.